By	Jake Redman	• 6 years ago	• Videos, Lounges: USA, DEN- Denver Intl. Click "more details" to get into this lounge! Unless you’re flying in or out of the western half of Concourse B at Denver Int’l (DEN) this may not be a quick stop, but if it’s convenient it could make for a nice pre-flight party or a long connection calmer. United Club West is big and wide open just like the view. Anyone up for speed dating while craning neck to watch Anderson Cooper? Odd seating arrangement at United Club Denver – West. 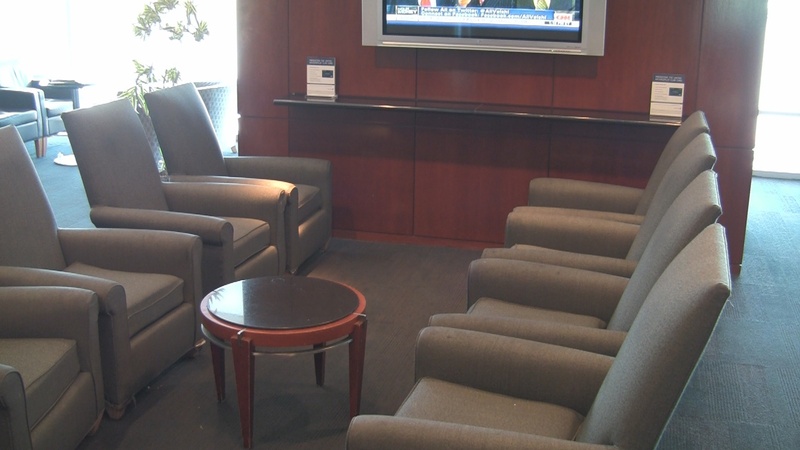 *As of early 2013, this lounge has been “refreshed” with new furniture and other upgrades. Some of the info in regards to seating both in the text and video might be out of date. Boarding Area friend Frequently Flying was able to capture some pics after the changes. Notes: I may be one of the very few that applauds United for not yet remodeling their lounges. That’s likely because I’ve seen what Delta has done to theirs. Wide open, loud, community spaces are what we want to leave behind in the terminal right? That said, United Club West at Denver Int’l offers up the best of both worlds with bigger, more open spaces with a few areas where solo travelers and smaller groups can relax. While it doesn’t offer as many compartmentalized, more private areas as say the former Northwest World Club-turned-Sky Club on concourse C at Minneapolis/St. Paul, this lounge does have some spots to be truly antisocial. The views are fantastic if you’re into airplanes (particularly United airplanes) or a mountainous backdrop worthy of any 3rd grade school picture. There are solo loungers and small groups of seats along the window for gazing outside. We wish there were more. At least they’re trying a little? 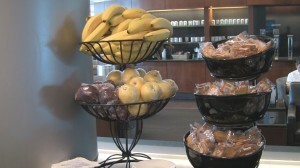 As healthy as it gets in the lounge. Service: Smiles and quick check-in. Lounge was clean and snack items were kept well stocked throughout. Consistent and friendly visit from start to finish. Convenience to gate: This is a long concourse, which is why they put a United Club on either side of it. If you insist on using this lounge over the other and your flight departs from a gate on the eastern side of the concourse (or another concourse for that matter), allow plenty of extra time. Summary: It’s still a little more open than we like, but this lounge makes the grade when it comes to variety in seating choices. Food selection underachieves even when compared to other lowly US domestic lounges but is consistent with what’s offered in US United Clubs. If yogurt raisins and a cup of coffee aren’t enough for you then the view might win you over like it did for us. 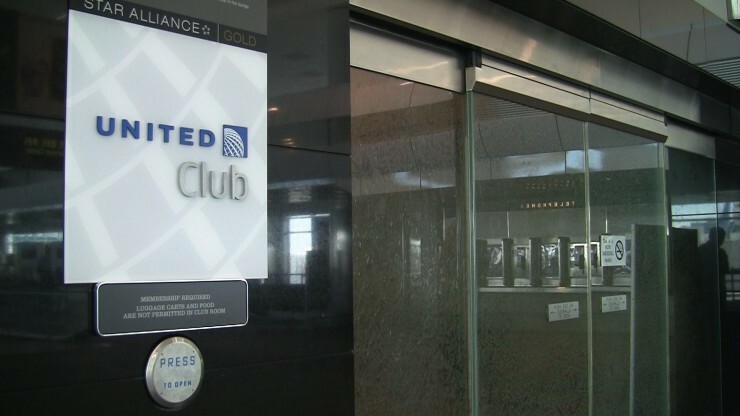 How I got in/Strategy: United Club members with up to 2 guests or immediate family are admitted. One time passes are available but not recommended unless offered and a steep discount. Priority Pass is also accepted. Thanks hulagrrl210. Lol. I missed the birds, but will keep an eye out for them next time. Love the video reviews! This site is great. This is the club that I visit most often. I think both the DEN United Club are in desperate need of renovation.